Editors Note: There is an image associated with this press release. BlackBerry Limited (NASDAQ:BBRY)(TSX:BB), a global leader in secure mobile communications, today unveiled the BlackBerry® Passport Silver Edition, a premium device built for business professionals who want a smartphone with the mobile tools they need to get things done - without sacrificing style or portability. The BlackBerry Passport Silver Edition is in a class of its own, featuring a stunning silver finish with refined, curved corners, large square touch screen display and reinforced stainless steel frame for extra strength and durability. An essential business tool, the device delivers the same productivity enjoyed by other BlackBerry Passport products, as well as an updated QWERTY touch-enabled keyboard, battery power that lasts more than a full day of mixed use, and BlackBerry® 10 OS 10.3.2. "We strive to deliver products that combine cutting-edge technology with purposeful, globally recognized design, and the BlackBerry Passport Silver Edition is the latest manifestation of this vision," said Scott Wenger, Global Head of Design at BlackBerry. "It brings together BlackBerry's latest OS platform, enhanced productivity features, and a refined industrial design based on customer and user feedback to deliver an unmatched experience for professionals who value precision and focus." Large High-Resolution Square Screen -The BlackBerry Passport includes a 4.5" square screen, 1440x1440 pixel (453 dpi) HD display and Corning® Gorilla® Glass 3 for added strength. Innovative BlackBerry® Keyboard - The BlackBerry Passport's revolutionary keyboard brings innovation to input with a responsive touch surface like a trackpad that lets you perform many touch functions directly on the keyboard. Scroll web pages, flick to type or slide along the keys to move the cursor, leaving the full screen space for viewing. BlackBerry® 10 OS 10.3.2 - The BlackBerry Passport comes preloaded with the new BlackBerry 10.3.2 operating system, including features such as BlackBerry Assistant and Amazon Appstore. BlackBerry World - BlackBerry World offers essential business and productivity apps for professionals looking to drive efficient communications and collaboration including Box, Evernote, Cisco WebEx Meetings and Documents to Go. Amazon Appstore - Discover and download popular Android apps and games through the Amazon Appstore including Candy Crush Saga, Pinterest, SoundCloud, Kindle and Amazon Shopping. BlackBerry Assistant - The BlackBerry Assistant is BlackBerry's first digital assistant and can be used with voice and text commands to help users manage work and personal email, contacts, calendar and other native BlackBerry 10 applications. BlackBerry Assistant intelligently determines how to respond based on how the user interacts with it - if you type, it responds silently, if you speak, it speaks back and if you activate over Bluetooth, it speaks back with additional context because it assumes you might not have access to the screen. Premium Components - The device is built for the most demanding user with durable materials mixed with top-of-the-line technology, including a Quad Core 2.2 GHZ Processor, 3 GB RAM, 13 MP OIS rear camera and 32 GB memory expandable with a Micro SD card up to 128 GB. BlackBerry® Natural Sound - BlackBerry Passport comes with powerful speakers and a quad microphone system that delivers a high-quality listening experience. BlackBerry Natural Sound Technology is built in to adapt Wi-Fi and cellular call sound depending upon phone position and background noise, automatically adjusting volume so you don't have to. The BlackBerry Passport Silver Edition will be available through ShopBlackBerry.com in North America starting today for $549 USD. The BlackBerry Passport Silver Edition will be available through ShopBlackBerry.com in the UK, France, Germany, Italy, Spain and the Netherlands in the coming weeks. Amazon.com, Carphone Warehouse and Selfridges will be launching the BlackBerry Passport Silver Edition online in the next couple of weeks. Selfridges will also launch the BlackBerry Passport Silver Edition in the BlackBerry Shop at Selfridges London. 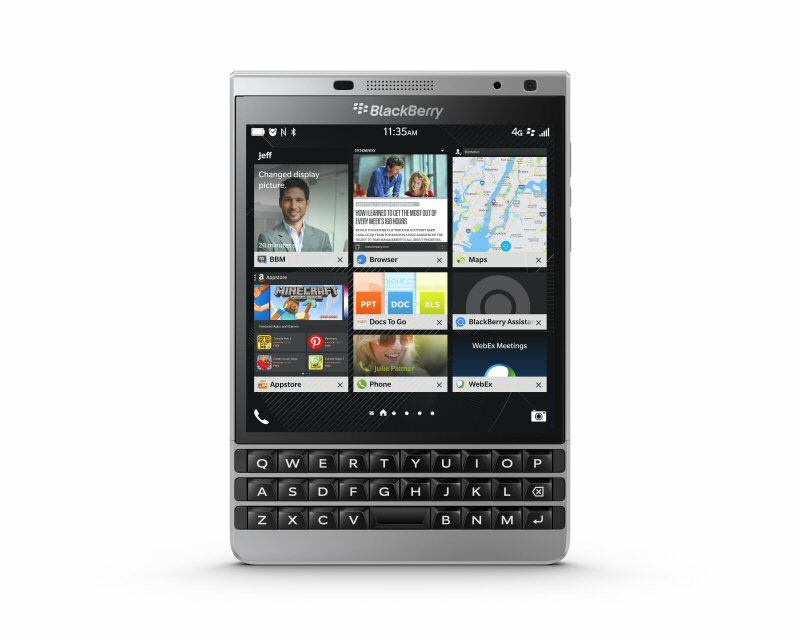 Distributors in select regions will also carry the BlackBerry Passport Silver Edition in limited quantities. A global leader in secure mobile communications, BlackBerry® revolutionized the mobile industry when it was introduced in 1999. Today, BlackBerry aims to inspire the success of our millions of customers around the world by continuously pushing the boundaries of mobile experiences. Founded in 1984 and based in Waterloo, Ontario, BlackBerry operates offices in North America, Europe, Asia Pacific and Latin America. The Company trades under the ticker symbols "BB" on the Toronto Stock Exchange and "BBRY" on the NASDAQ. For more information, visit www.blackberry.com. *Based on mixed usage scenario. Many factors affect battery life, including network connectivity, application usage, feature configuration and battery age. Actual results may vary. ** Requires download of BlackBerry® Blend app and pairing with a compatible device. BlackBerry Blend works across desktop operating systems, including Mac OS X 10.7 + and Windows 7+, iPad tablets running iOS 7+ and Android tablets running Android 4.4+. For more information visit www.BlackBerry.com/Blend. *** Savings, timing and terms and conditions will vary by country and currency.